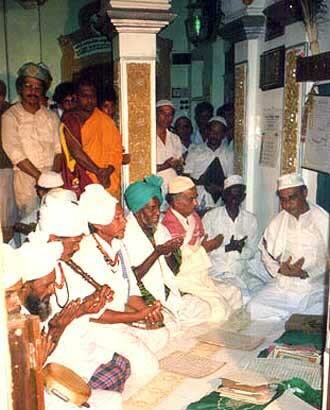 Above: Rifai faqirs at Kataragama Mosque & Shrine. Below: Rifai faqirs recite dua in Khidr Maqām. Kataragama Mosque & Shrine Trustee al-Haj M.H.A. Gaffar seated at right. 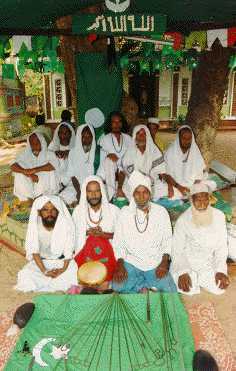 In 1888 Dr. M. Covington 733 wrote that the 'Mahomedans' who visit Kataragama temple asserted that "there is a hidden spring in the immediate neighbourhood, close to the bed of the river, the water of which has the power of rendering life immortal, as it did to one of their saints named Kadra Nabi, who had first discovered and drunk of it." 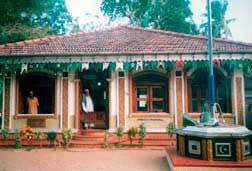 He adds that under this impression, they have also a small monument close to the temple of Valli Amma dedicated to their saint, and take also a part in their own way, in the celebration of this festival, burning incense and saying prayers every night. The shrine, it is said, had been in existence for a long time, firstly in a most crude form consisting of just one wattle and daub room called 'Khizar room' hardly 15 feet by 15 feet.735 It was however not very long before miracles came to be attributed to that mysterious being after whom it had been named, not only in Sri Lanka but also in South India where we have a Tamil text, the Kanzul Karāmat claiming that a famous 16th Century Indian saint, Shawl Hamid, was mysteriously brought over to Sri Lanka by Khidr and placed on the banks of the Menik Ganga where in the company of angels, the robe of Kutbul Akhtab was conferred on him. The influence of the Khidr cult in the country is also apparent in the writings of Ibn BattOta as far back as the le century where we find him mentioning the cave of Khizr where the pilgrims to Adam's Peak left their belongings before ascending to its summit. He even mentions a spring also called after Khizr and full of fish which no one catches. There has been considerable dispute among Muslim commentators as to who Khidr is. Some say he is a prophet while others say he is a wali, meaning one close to God, in other words, a saint. There can however be little doubt that it is he who figures in the Qur'an as the unnamed servant of God who initiates Moses into the mysteries or rather paradoxes of life. The Holy Book in Saratul Kahf or the Chapter of the Cave has it that this servant of Allah was taught by the Almighty out of his own knowledge (min ladunna ilm) and that Moses in turn requested him to teach him something of that divine knowledge. Moses proceeded to travel with him, only to find his companion committing three seemingly unjust deeds, scuttling a ship, killing a boy and repairing a well for an inhospitable people. On being questioned by Moses, his unnamed companion gives him three valid reasons why he had committed those deeds, providing an interpretation of those matters of which Moses was unable to grasp. Thus the scuttling of the ship is explained as a prevention to its seizure by a certain king, the killing of the youth because he would oppress his parents by rebellion and disbelief and the repairing of the wall because beneath it lay a buried treasure to which two orphans were entitled, their father having been a righteous man. The story seems to imply that this mysterious being was bestowed with knowledge ordinary mortals were unable to comprehend. Who he was is clearly mentioned in a hadith or saying of the Prophet recorded in Bukhāri where he figures in an episode identical to that related in the Qur'ān. He is here called Al-Khadir and described as a man covered with a garment. Another tradition of the Prophet recorded in Bukhāri has it that Khidr was so named, because if he sat over a barren white land, it turned green with vegetation. This belief is also reflected in the Alf Layla Wa Layla where we have an allusion to Al-Khidr planting a pomegranate tree which forthright grew up and foliaged, flowered and fruited. Around this mysterious personage has grown a number of folk beliefs in various parts of the Muslim world, especially in Asia Minor, the Near East and the Indian subcontinent. The mystical tradition of the Sufis has it that he is immortal, having drunk of the Maul Hayat or 'Water of Life' 738 though one wonders how this could be reconciled with the statement in the Qur'ān that every soul shall taste of death. In Turkey, Khidr is known as Hizir and is said to appear before human eyes in the form of a frail old dervish with a long white beard. He is regarded as the patron saint of travellers, protecting them from the hazards of the road and is also said to rescue men from disaster. 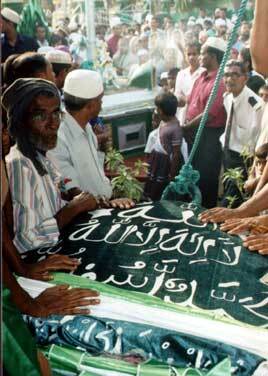 In India, Khidr is known as Khizar. He is said to have discovered the water of life and is considered the saint of waters. The Indian Muslims of yore even went to the extent of offering oblations of lamps and flowers to him placed on little rafts and launched on the river, particularly on Thursday evenings in the month of Bhadon. 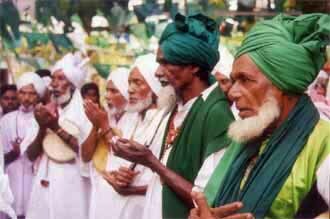 739 It is evident here that the beliefs and rituals that have grown round Khidr in these countries are somewhat different from those existing in Sri Lanka where considerable South Indian influence such as in the case of the flag-hoisting is evident. The Mā'ul-Hayāt or 'Water of Life' figures in a tradition in Bukhari where it is stated that those who are taken out from the fire of hell by the angels on account of their faith in God would have such water poured on them so that they spring out like a seed springs out on the bank of a rainwater stream. In another tradition recorded in Bukhari which is connected with the Khidr episode, we are however told of a water spring called al-Hayat in a rock near which Moses found Al-Khidr none came in touch with its water but became alive.